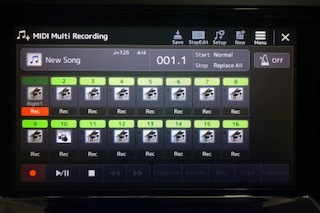 Learn how to use Multi Recording mode. 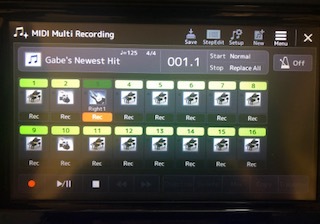 Welcome back to Genos Power Playing and the second of our two-part series on MIDI recording. 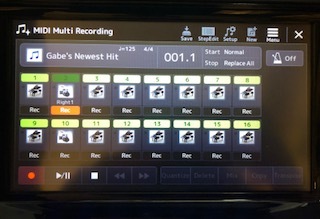 In Part One, we focused on using Quick Recording mode, which is great for capturing ideas since Genos arms or activates every channel. 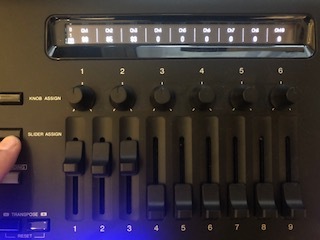 This is especially useful when recording a Style, which can have up to eight tracks of instrumentation playing back at once. This time we’ll dive deep into Multi Recording, which allows you to start from scratch and build a complete song track by track. 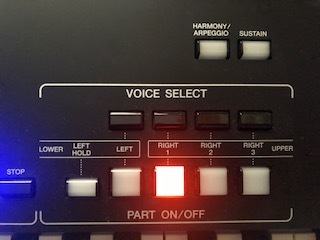 For this demonstration, we’re going to be recording single part instrument voices (no layers or splits) and lay down a simple three-track song, one track at a time. Now let’s un-arm (more properly called “disarm”) the 15 tracks we don’t want to record. 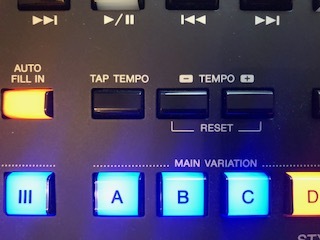 Simply deactivate tracks 2 through 16 by touching the red “Rec” icon beneath each track. You’ll notice that as you do this, each disarmed track number will turn green. Genos is now in Record Standby mode, meaning that, when you strike a key, recording will begin. Go ahead and start up the metronome and you’ll hear it begin clicking at the current tempo. (Turning the metronome on will not start the recording.) Once you’re comfortable with your chosen tempo, just start playing and Genos will begin recording. When you’re finished, touch Stop (the square icon at the bottom of the screen). To play back what you’ve recorded, touch the Play/Pause icon at the bottom of the screen. 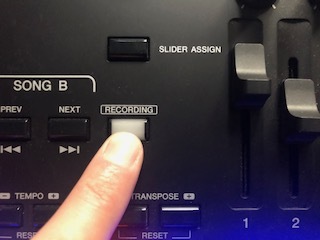 If you’re not happy with your recording, simply touch the Record icon in the lower left-hand corner of the screen and try again. 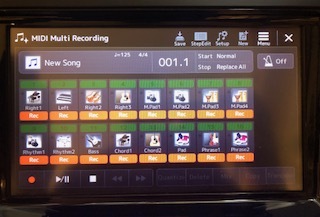 If you are happy with what you recorded, this is a good time to save your song. 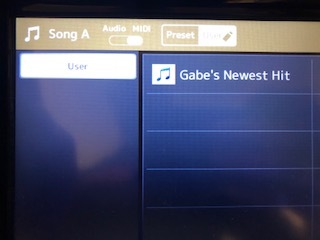 Type the name of your new masterpiece into the character field, then press OK. At this point, you can confidently power down the Genos with the knowledge that your song has been saved. Turn the metronome back on, and when you’re ready to start recording, either start playing, or touch the Play/Pause icon at the bottom of the screen. 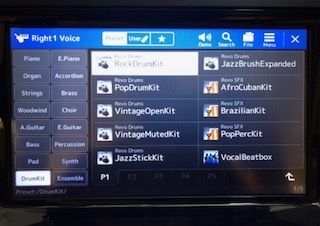 When you’re finished laying down your drum track, touch the Stop icon at the bottom of the screen. Now touch the Play/Pause icon again and you’ll hear Tracks 1 and 2 playing back simultaneously. 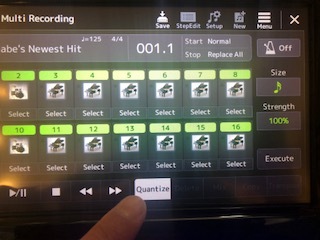 Manually playing drums in time can be challenging, so Genos gives you the ability to quantize note data. Quantizing essentially moves notes you’ve recorded so they line up timing-wise with the beat. Touch this and various Quantize options will appear to the right of the screen. For now, let’s stick with the default sixteenth note size with the strength at 100%. To apply this, select the Track/Channel you’d like to quantize (in this case, Track 2, Drums) and touch Execute. 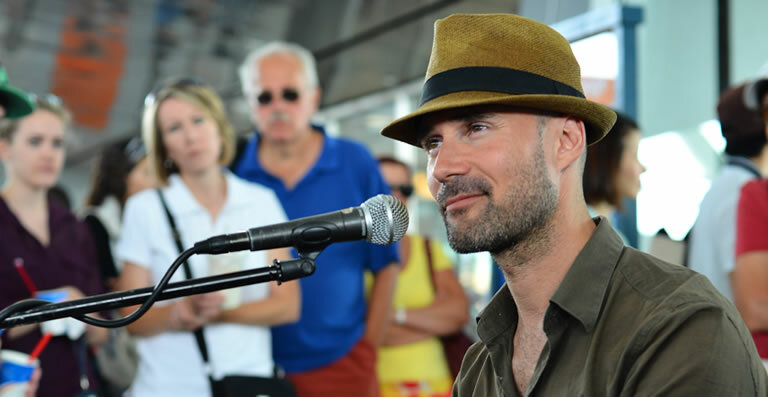 When you now play back your song, you should notice that the drum beat sounds tighter and more in time. 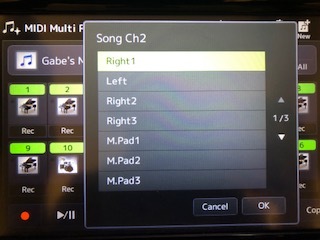 If you’re happy with what you’ve recorded on Track 2, go ahead and save again: Touch the Save icon at the top of the screen, select the current song you’re working on and touch the “Save Here” icon in the upper right-hand corner of the screen. 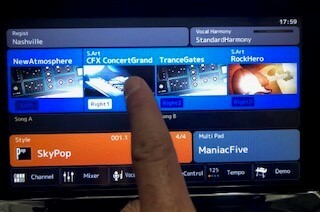 You’ll be given an opportunity to rename the song or just leave it as is, then touch OK in the lower right hand corner of the screen. Genos will ask you if you’d like to overwrite your current song. Select “Yes” and you’ll be taken back to the recording screen. 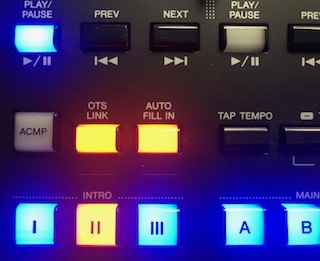 Faders 1, 2 and 3 now control the volume for Tracks 1, 2 and 3. Start your song playing back while moving the faders up and down. You’ll notice the volume levels of your three recorded tracks will get softer or louder. When you get the mix just the way you like it, simply save it again. 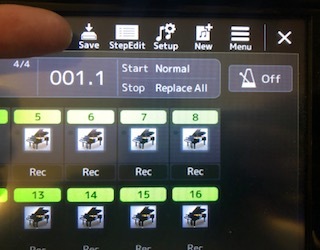 By repeating the steps above, you can record 16 individual MIDI tracks and mix them all independently, without ever cracking open a laptop. How cool is that!